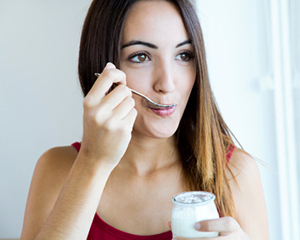 One of the foods that are great for your mouth year round is yogurt. It provides a lot of calcium for your teeth, and it allows for your mouth to get access to nutrition in a soft, easy to eat manner. If you recently underwent oral surgery, making sure you have soft foods to choose from is imperative to your ability to eat following surgery. Yogurt should be one of the foods you reach for first. Here are just a few reasons why! Following any type of oral surgery, your body is trying to heal. This could be from a bone graft, or even something more minor like an extraction. The bone surrounding the extracted tooth, or where the graft was placed, needs to heal back up to restore your mouth to a healthy place. By offering your mouth more calcium, it can begin to heal more quickly without pulling calcium from other parts of your body. After oral surgery, swelling is typically what causes the most pain initially. If you eat cooler foods, it can help decrease the swelling a bit, leaving you in less discomfort. Eat yogurt, cold out of the fridge, or even slightly frozen out of the freezer if you want it to do a little more good. Some foods are more apt to get stuck in surgical areas than others. If you were to eat noodles, the small pieces may get stuck where a tooth was extracted. Yogurt, on the other hand, is not likely to get stuck anywhere. This allows you to eat and clean your mouth with ease. For more suggestions on foods to eat following oral surgery, contact our office before your procedure. They have a full list of options!